San Pedro de la Roca Castle, Santiago de Cuba, is a 17th century fortress which is considered the best preserved and most complete example of Spanish-American military architecture. The castle and associated batteries protected the canal that leads up to the harbour of Santiago. The castle was designed by the Italian Giovanni Battista Antonelli in Renaissance style. It was built on a promontory (morro in Spanish) with steep cliffs. Series of stairways connect the various levels, with constructions dating from various ages. The fortress has been damaged and rebuilt several times after earthquakes and piracy attacks. Castillo de San Pedro de la Roca del Morro is located about 10 km to the south from Santiago de Cuba on a strategic rock controlling harbor entrance. After over 150 years of painful planning, designing and construction, many times interrupted by the military attacks from competing colonial powers and pirates and earthquakes, it was more or less completed only in 1700s. The fortress served as prison once pirate threat declined in 18th century (you could visit some tiny prison cells). 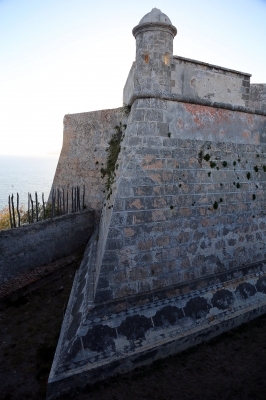 Castillo is considered the best-preserved Spanish colonial military fortress. It is quite compact site with stunning views over the sea, deep mounds, sharp edges and everything you expect from a military fortress. For a European eye is does not look something special but taking into consideration all the circumstances Castillo found its deserved place in the WHS list. Inside there are some rooms dedicated to the Caribbean piracy. All in all, good site and pleasant excursion from Santiago de Cuba. I was surprised not to find any evidence of fortification on this side of the harbour entrance. Once back in Ciudamar it's a walk of about 20 minutes to the foot of the hill on which the castle itself is located. It has grown over several different levels, the lowest being a little above the high water line with some of the rooms carved out of the soft rock. Some of the castle rooms are now used as a museum illustrating local building techniques and telling the story of piracy in the region. There was also a restaurant. I was able to wander hassle-free at will throughout this very impressive example of (mostly) Spanish military architecture in a Caribbean setting. All in all a very rewarding day's excursion from Cuba's second city. 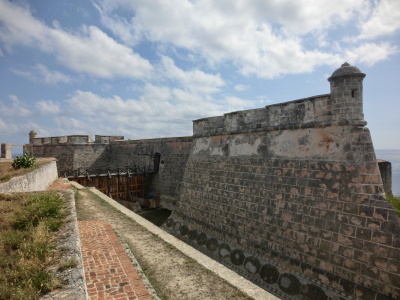 Prison: AB: "From 1775 the Castle served also as a prison and many important political figures where imprisoned there"
Bombarded by the British Navy: the Royal Navy under Rear Admiral Charles Knowles unsuccessfully bombarded this Cuban, Spanish-occupied castle, also called the Castillo del Morro, in April 1748 during the War of Jenkins' Ear.